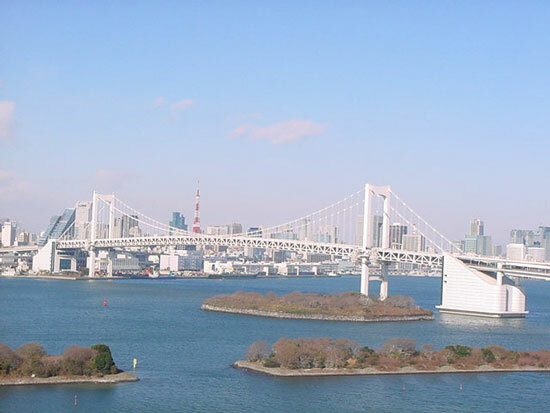 The Tokyo Rainbowbridge stretching from mainland Tokyo, Minato-ku to Odaiba, one of Tokyo's most popular tourist spots with its classy shopping malls and a very popular entertainment district has a total distance of 918 meters. The distance between its two main towers is 570 meters. The rainbow bridge has two sections: the upper section which is an eight(8) lane expressway and the lower section which serve as an ordinary road with side-walks. Also located in the lower section is the popular Yurikamome, an unmanned monorail line which carries passengers between the Tokyo mainland and Odaiba Island. 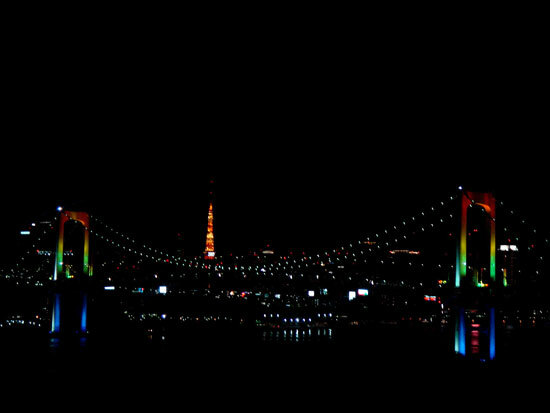 This is the picture of Tokyo Rainbowbridge on the night of december 30th 2007. I took this photo from my Nikko Hotelroom balcony. The end of year illumination on the Tokyo Rainbowbridge at the end of 2007 was simply fantastic; rainbow patterned blue, green yellow and orange graduation actually made the bridge look every inch like a true rainbow reflecting against the lake below. Also seen standing in the curve from the distant is another popular Tokyo landmark, the Tokyo Tower. Day or night, the Rainbow bridge is a beautiful sight. Compare the photo above with the one below, the same Tokyo Rainbow Bridge showing the Tokyo Tower(orange and white) taken from the same spot the next morning, december 31st. It was a quiet winter morning with clear blue skies and the bridge stood there, suspended over the calm lake inviting tourists, sightseers and the millions of users who cross daily between the mainland and Odaiba.